Author Tony Piazza is an Italian American San Francisco Bay Area native who spent most of his free time reading novels that immersed him in every kind of adventure and mystery, from Jules Verne to Edgar Allan Poe, through tales that carried him over the western plains with that romantic cowboy Louis L' Amour, to even a few side trips through the great works of Shakespeare. And yet, with all these diverse genres to choose from, Piazza found himself spending hours reading the most famous of all mysteries, those written by Sir Arthur Conan Doyle, Agatha Christie, and Raymond Chandler. Piazza, like most kids of his generation, also spent his early years in the seat of the local Saturday matinee movie house where he cheered on those childhood literary heroes so realistically brought to life on the silver screen. This interest in film would later became a passion for Piazza, motivating him to learn more about film making, and subsequently inspired him to train in acting and take classes in cinematography. But Piazza brings more to his writing then just book learning; the use of Hollywood as the backdrop is a result of all the years he spent on movie sets with his dad, who was in law enforcement and was employed by the major studios to protect their biggest stars. Piazza learned a lot while working on the set with superstars, such as Clint Eastwood, Steve Mc Queen, and Paul Newman. He also earned a degree in Biology and has worked as a Histology Technician for the Pathology department at the San Francisco Veterans Administration hospital, and is presently employed as a QA Assistant Manager at a food safety laboratory. Tony Piazza is the author of 4 bestselling novels: Anything Short of Murder, The Curse of the Crimson Dragon, A Murder Amongst Angels and his latest, Murder is Such Sweet Revenge. Piazza's, A Murder Amongst Angels, touches on vintage Hollywood and the days of Hollywoodland. Characters and buildings are described in such great detail as to give the reader a real sense of their history and of the growing city at the time. Cafes, restaurants, night clubs, city hall, they all get a detailed picture that develops in the reader's mind's eye and stays there to let our imaginations soar with it, to see it all as it actually was, "at that time, in that day." The author, Tony Piazza, informs the reader of the architecture and historical facts behind many of these grand Hollywood buildings and the lesser known ones as well.... and it makes the reader feel a strong sense of the locale- that's what a really fine writer does for his readership ... and that's exactly what Tony Piazza does for his readers. The story is inspired by a true life Hollywood scandal, the death of Thelma Todd, a Hollywood Star who had connections with the roughest mobsters and the most powerful men in Hollywood, and a slew of jealous lovers and friends. Thelma Todd was found dead in the garage of her restaurant and apartment complex, a garage that was high above the hillside. Her case was never solved to anyone's satisfaction, and so A Murder Amongst Angels gives us one author's idea as to what may have actually happened, with the use of dramatic license. Cookie:�Hello Tony and Benvenuto! I've interviewed many singers and several actors for my column, but a mystery writer with a new book on the best seller list is especially exciting to me. Tony:�Thank you Cookie for this opportunity. I'm pleased to do an interview with Italiansrus.com. Cookie:�Tony, before we talk about your fabulous new book. I know my readers would like to know where in Italy your people are from. Do you know what regions? Tony:�My father's family was from Catania, Sicily, and my mother's from Catanzaro, Calabria. My paternal grandfather came to America in 1900 settling in the Sacramento, California area where he and his brothers started a business growing oranges, almonds, and making olive oil. My mother's father came over later perhaps in the 1920s. He worked in the coal mines in Pennsylvania before moving his family to San Francisco. Cookie:�Have you yourself every made the trip to the Old Country, to check out your family roots? Tony:�No, but I would love to someday. It's kind of sad that neither of my parents were able to visit where their parents came from. I'll try not to make the same mistake. I do believe that the trip would stir my imagination. From all that I have seen and heard, it is a rich, beautiful, and extremely cultured country. Just look at all the authors, artists, and inventors that came from it. I am sure I would feed on those creative juices. Regarding it as a setting for a mystery; it is perfect. These stories works well if there is a contrast, and the bright colorful setting of Italy would complement the dark goings on of a mystery/suspense novel. Some writers that have used Italy successfully in their mystery novels are Donna Leon (A Question of Belief), Edward Sklepowich (Death in a Serene City), and Andrea Camilleri (The Terra-Cotta Dog). Cookie: Tony, one of the most important things a writer creates is his characters. If the reader doesn't feel a simpatico with them right off, they could lose interest in the first chapter. When you first thought of the characters in your book were they already in your mind's eye, did you see them clearly as people you knew along the way and recalled their mannerisms and features to fit your character's part. Or do you just create a character out of the blue with no connection to anyone you once knew or know? Tony:�Yes these characters were already formed in my head, because I knew what the audience expected. The novel began as a serial story for the Turner Classic Movie fan site. Members of this site love the classic crime noir films of the 1930's and 40's. Writers from that period such as Raymond Chandler and Dashiell Hammett had a certain formula and style which I tried to purposely imitate in my novel. So it shouldn't come as a surprise if my detective didn't remind one of Phillip Marlowe or Sam Spade. The readers were looking for a story like The Maltese Falcon, Big Sleep, or The Thin Man, and that I believe was what I delivered. The book is big on nostalgia, and I received many favorable comments for that in my reviews. Cookie:�A mystery writer's pen has the power to intrigue and to twist a plot in order to play with the reader's mind. Then, at the very last minute, you pull out a surprise, exciting, mystery finish. This is no easy task. Does this mean you write the beginning, middle and ending before you start the book? Please help a laymen know how this is done. Tony:�I did have an outline, but mostly in my head. And quite honestly, even though I did have one I didn't always stick to it. I feel that this created a certain unpredictability about the plot that made the puzzle work well... and it did. I had only one reader so far say that they had guessed the killer. I do want to say that I was fair with the readers...all the clues were there...and if they followed the events logically as they played out the answer was evident. That's the best part of a whodunit, creating the puzzle. It was for me the most fun of writing the novel! Like Ellery Queen asking his audience, "all the clues have been presented, now it is up to you to guess whodunit!" Again, great fun! Cookie:�Tony, you are well schooled in the science of Forensics, did your studies in the application of these scientific methods and techniques help you with your imaginary investigation? Crime readers are real sticklers for the exact truth when it comes to the research part of the crime detecting. And that's what you must be a writer who exposes a crime then tell us exactly how it was done and whodunit! Right? Tony:�I have a B.A. in Biology, and spent most of my career in the scientific research field. Here you play a detective, but the killer is usually microbes. Especially when I did biopsy work for the VA hospital in San Francisco, I was always looking for clues that would point to a proper diagnoses. You have to be detailed oriented and concerned with logic and facts in this field. There is no room for mistake. I also loved and read mysteries all my life. To be familiar with style, characters, and settings were extremely useful and, finally, I had a father who was a police officer. I spent a great deal of time around his friends, homicide inspectors, etc. and listened to their tales. A writer takes all those associations and uses them in his writings, and that is what I did with Anything Short of Murder. Cookie:�You worked on Quinn Martin's hit production of the TV series, The Streets of San Francisco, with Michael Douglas and Carl Malden. I know you were Michael's stand it, but even so that is a big step up in the right direction for a young aspiring actor. Were you able to do any acting scenes in the series? Tony:�Yes, I had a speaking line in the episode "Shield of Honor." I also had a line in the Clint Eastwood film "Magnum Force." I am the young cadet in the crowd at the shooting range that shouts that Harry hit the "good guy" target. As a result, he loses the match in the story. On "Streets" I had to wear many hats, like being a passenger with a stunt driver in a couple of car crashes. One in particular was doubling Larry Hagman in the episode, "Dead Air." I also had many silent bits on the series, usually as a policeman, all this in addition to my stand-in duties. I worked in the business for about 10 years, and I used that experience in my novel. Cookie:�Well, Tony, we are coming to the end of our interview. But before you go could you leave your website, blog address, and any other info that will help our readers to discover more on you and your exciting books, history, many novels, and your latest, Murder is Such Sweet Revenge. Tony:�The best way to get any and all information on my books and blogs is my website address: www.authortonypiazza.com. And the books can be bought on Amazon, and Barnes & Noble websites, or wherever fine books are sold. 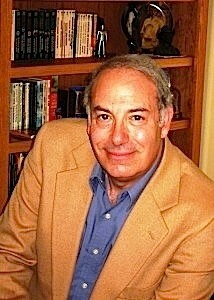 Thank you so much, Cookie, I'm pleased to have been interviewed by you for such a prestigious Italian American Website as Italiansrus.com, Grazie and I hope your readers enjoy my latest mystery.